As someone who occasionally has to make presentations, I am always looking for ways to be a more effective communicator. In the new book Secrets of Dynamic Communication by Ken Davis, the founder of Dynamic Communications International, a blueprint of speech preparation is presented that is designed to not only take away the anxiety of giving a speech, but to also help the presenter become much more effective in presenting his or her message. Many people dread presentations, and the author points out the familiar statistic that public speaking is second only to death in the greatest fears that people confront. I liked Mr. Davis' "get over yourself!" advice that the speech isn't about you (the speaker). The anxiety most speakers face is due to the overwhelming desire to get the audience to like them. This is where the problem arises: the point of any presentation isn't to make the audience like you, but rather to impart some information that's going to help or persuade the audience members. If only we could remember that once piece of advice, I think it would take a lot of the pressure off! Then Mr. Davis gives concrete suggestions for how to construct your presentation. His main advice: have only one objective for your speech. Many speakers try to cram in too much into one presentation, include too much irrelevant information, and don't have a clear focus. The result is that, in one example he cites, 70% of people polled after leaving a presentation had no idea what the speaker had been trying to communicate. Using the SCORRE method to construct a speech will ensure that your ideas are all geared toward communicating your one objective. SCORRE stands for Subject, Central Theme, Objective, Rationale, Resources, Evaluation. I really liked that a section of the book was devoted to each of these areas, and concrete examples were given. There was also good advice on how to involve the audience, the use of body language, and how to incorporate humor into your presentation. 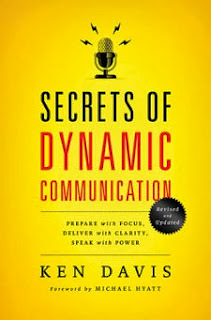 I think any potential speaker would benefit from the lessons and advice in this book, both in terms of preparing a presentation, and getting over some of the nerves that accompany public speaking. Disclaimer: I received a copy of Secrets of Dynamic Communication from the BookSneeze program in exchange for this review.